What does mapping affordable housing teach us? Although i no longer work for a housing association, I still often work with them now as clients and its an area that still interests me and obviously its something thats very current with ‘interesting’ government policy picking up post-election where IDS’s pre-election Oveton windowing left off. So I thought i’d try using the wonderful Wardley map technique to help me think about affordable housing. The model below is just a sketch, i go by the E.P. Box quote of ‘All models are wrong, but some are useful’ as a motto. My intention is to develop this model over time, but even this sketch sparks some interesting thoughts. 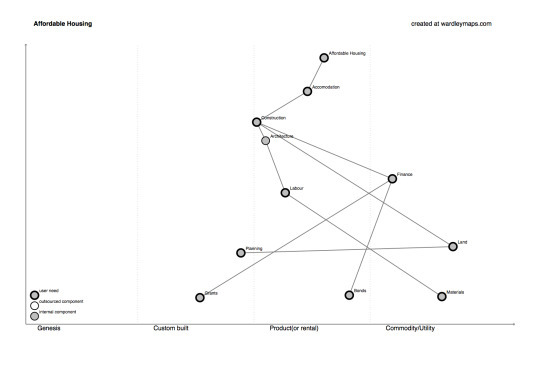 The map is a value chain (starting with user need at the top and then moving down the Y axis to its dependent parts. The X axis moves from Genesis->Customer Built->Product->Commodity, the phases of which each of the components will go through over time. I’ll leave the explanation of Wardley maps there, Simon’s blog has some great material doing a much better job than i could. The user need for affordable housing, I’ve placed that within Product on the X axis as its a reasonably well-defined Product category. Flowing from that need is the need for accommodation, the actual dwelling that would be occupied. I’ve placed this further to the left on the Product phase to denote the myriad of ‘product’ that could be classed as accommodation. Next is Construction, the actual creation of the accommodation, i’ve placed this in Custom Built, ok there are plenty of building companies (even a conglomerate of housing associations) that are developing/have developed off-the-peg house products and factories, but this isn’t standard construction (in the UK) yet. Prong 1: Land, is placed in the commodity space, Assuming i have the money i can just buy land, its not infinite, but then neither are other commodities e.g. gold. From Land flows Planning, i’ve placed this in Custom Built on the X axis, I can’t just buy some planning (although some conspiracy theorist-type people might say you can :)), its a ritualistic and prevaricatory process. Construction also flows to Architecture, the generic term i’ve given to the design of the accommodation. I’ve placed this to the right edge of Custom Built as its rarely an off the peg process (see my description of Construction). From Architecture flows Labour, the actual implementation of the design and the creation of the accommodation. I’ve placed this within Product, construction is performed by defined trades, brickie, chippie, plumber, etc, for the purposes of this analysis they are defined products that you can buy (hire). From Labour flows the Materials needed to construct the house, these are Commodities, wood, slate, etc etc. Construction also flows to Finance, the Money to pay for the development of new accommodation. I’ve put Finance in the commodity phase. Similarly near the bottom of the value chain Materials are commodity, but Labour and Architecture are not. As mentioned above many small scale house builders are building what you might call commodity housing (factory built components, prefabricated compents etc), but this isn’t how the majority of new HA stock is built. Why not? I don’t know the answer to this question (maybe its to do with the commercial relationships we have with developers, something i should map on the next iteration of this map), but surely this must be a huge area of focus. It seems obvious (because it is) that if we move Architecture and Labour towards commodity then we can build more, cheaper and faster. It will be interesting to see if the HA house factory metioned above is a success and becomes a model adopted by more HAs. Further up the value chain is Planning and Land. Land is a commodity, but depends on Planning which i’ve put in Customer Built. The focus for HAs should be to move Planning towards a commodity. The current government have made moves in this area but i think its for HAs to push/lobby further in this area. 2) Placement of components on the X and Y axes.